Four religious truths: 1. Muslims do not recognize Jews as God's chosen people. 2. Jews do not recognize Jesus as the Messiah. 3. 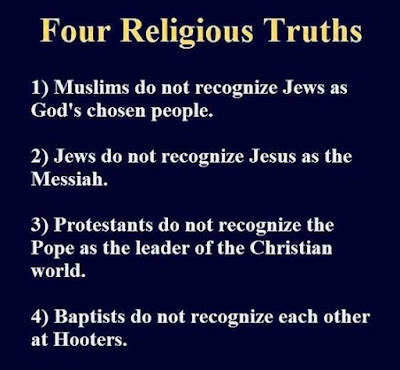 Protestants do not recognize the Pope as the leader of the Christian world. 4. Baptists do not recognize each other at Hooters.